What’s new in hair loss treatment for women? A recent study done in Prague, Czech Republic, has shown that high does of finasteride help to stop hair loss in women. The investigators concluded that the results were significant, however, not everyone in the study responded to the medication. In order to qualify for that study, certain hormone tests had to be within normal limits. Additionally, patients were placed on oral contraception to avoid fetal complications from the finasteride. This study is a step in the right direction for the treatment of female pattern hair loss, however, this medication would not be suitable for every woman with this condition. Many excellent clinical results have been also obtained from adjusting women’s vitamin and mineral supplements, in addition to other oral and topical medications. What is a skin scan? Many people refer to a total body skin examination as a skin scan. This examination is done by a qualified dermatologist to evaluate patients’ skin for malignant and pre-malignant lesions (growths). Skin cancer is a significant problem for people who have had significant sun exposure at any time during their life—even as a child or young adult. During a skin scan, every square inch of skin on the face and body is carefully examined. This can only be done accurately by a trained professional. An accurate diagnosis of a malignant melanoma can be life saving. I recommend that anybody who has had significant sun exposure in the past be examined every six months starting as a young adult. Any of my patients who have had melanomas or other significant skin cancer are asked to return every three months for a total body skin scan. It should be remembered that the skin is the largest organ of the body and not only is it vulnerable in itself, but it can also be a window to other medical conditions within the body. What’s new in tattoo removal? For a long time, laser has been the standard for tattoo removal but now there are many newer, less invasive techniques that we offer. Make a call for a free consultation to evaluate your options. Is there a problem with the use of sunblock and vitamin D deficiency? 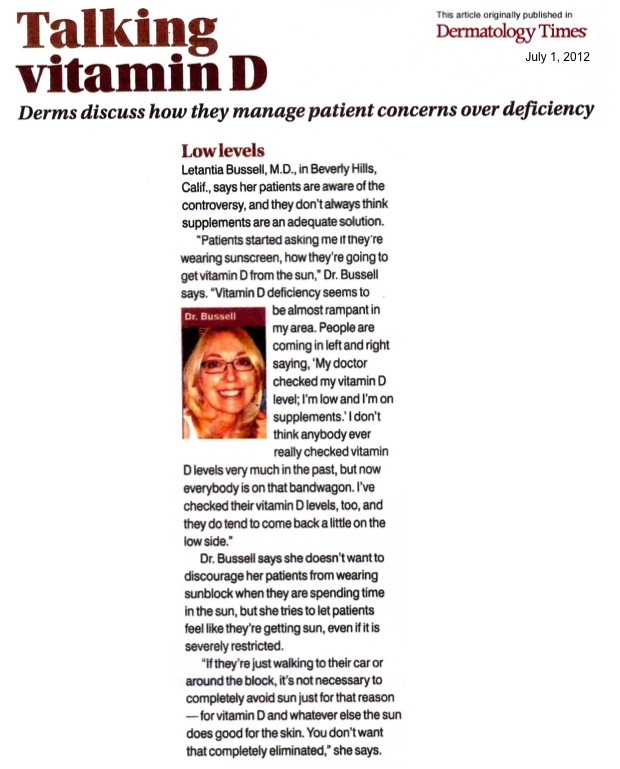 This is something I was recently asked to discuss for Dermatology Times. People are now becoming more and more aware of vitamin D deficiency as a reason for various medical problems. The question has arisen in my practice whether or not the use of sunblock is responsible for lower levels of vitamin D in conscientious sun avoiders. Until a scientific study is done, we cannot say for certain however it seems reasonable that one should not totally avoid the sun as vitamin D metabolism is influenced by it. I recommend that my patients do use sunblock but use it appropriately. By that I mean to use it on sun-exposed areas when there is extended exposure to the sun as when playing sports or going to the beach. Simply walking back and forth from one’s car to work inside a building may not require the use of sunblock. A little bit of sun is obviously good for the skin, realizing however that burning is harmful. A easy rule of thumb is if you are going to be in direct sunlight for more than 15 minutes, you should apply sunblock unless you have very sensitive skin that burns sooner than that. Additionally, one must be careful not to overuse sunblock due to the fact that sunblocks do contain chemicals and the skin does absorb chemicals that are applied to it. Therefore, we should minimize unnecessary exposure to chemicals. This is why I don’t recommend moisturizers that contain sunblock. Individuals have a tendency to put the sunblock-containing moisturizers on at night as well as in the daytime and there is no reason to protect oneself from sun that isn’t there. My preference for a sunblock is one that is no stronger than an SPF 30. I also prefer sunblocks, like ours at Beverly Hills Dermatology Consultants, that contain tried and true ingredients rather than sunblocks that strive to incorporate newer ingredients that have not been tested for very long in the general population. What’s new with Mini Face Lifts? Dr. Bussell’s Beverly Hills Dermatology Consultants has become well-known for mini face lifts. The procedure is relatively quick and done with very few stitches and helps to remove sagging extra facial skin thereby returning patients to their prior youthful appearance. What’s particularly nice is that in most cases patients are back to their usual routine the next day. The procedure has been modified now to be used to reduce extra skin on almost any part of the face. Did you ever wonder what can be done about scars? Many people either through various injuries or surgical procedures develop scars on their skin. Many people assume that there is nothing to do about these scars. In fact, there are many ways to treat scarring. Some scarring results in thickened skin; some scarring results in stretched skin. Scars can also result in the development of blue or red discoloration due to new blood vessel formation beneath the surface of the skin. Some people refer to darker, pigmented skin in a local area after an injury or insult as scarring. No matter what kind of scarring someone has, it can almost always be made to look better. Thickened scars can be injected with appropriate concentrations of cortisone, and I say appropriate concentrations because it is important not to inject too high or too low a concentration of this medication. Therefore, this should only be done by someone very experienced with cortisone injections. Appropriate injections can flatten a scar almost completely. Scars that are stretched can frequently be re-excised and brought together with less tension on the surface of the skin resulting in healing without a stretch mark. Scars that develop prominent blood vessel formation resulting in the red or blue discoloration can usually be treated by superficial electrocautery of the area. Scars that are darker or hyper pigmented respond nicely to specially compounded skin bleaching medications. If you have a scar from an old acne breakout, an injury, a surgical procedure or even an insect bite reaction, there are things that can be relatively easily done to improve the appearance of the area and significantly minimize the scar. What can be done for large pores on the nose? Large pores on the nose can be genetic or the result of excess oil accumulation in the pores. The pores are actually passageways through which the body’s oil (sebaceous) glands normally secrete oil. If oil secretion is excessive or if the pores are clogged at the surface, the accumulation of oil can darken and become what are known as open comedones (blackheads). Large pores on the nose can also be seen with a condition known as rosacea, which is treated similarly but more aggressively. It is helpful to avoid moisturizing the nose as this only adds more oil to the area. Drying and peeling agents are very effective to reduce the size of the pores. Our oily skin cleanser, when applied to a gauze pad or washcloth and gently rubbed on the open pores twice a day is very effective in minimizing the oil content of the pores. Additionally, facial acid treatments/chemical peels are very effective for minimizing this condition. Our Sal-Hydro™ helps dissolve, as well as lighten, the material within the pores. In our office, we do mild chemical peeling with trichloroacetic acid, which is also highly effective in reducing the pore size. Occasionally instrument extractions are used, however this must be minimally done and only under specific circumstances and only in a dermatologist’s office under sterile conditions. I highly recommend that instrument extractions or manual extractions of any kind not be done at home or in any other facility besides a dermatologist’s office. This is not only because of problems with sterility outside the dermatologist’s office but also because improper squeezing of the nose can lead to irreparable scarring and permanently enlarged pores. The use of non-sterile instruments, fingers, tissues, or cotton swabs, which is frequently done outside of a dermatologist’s office can result in infection and more scarring. The secretion of oil by the sebaceous glands on the nose is a normal biological process. Consequently, the production of oil will continue and treatment is ongoing. In particular circumstances, we use Botox or Dysport injections to decrease oil production. I cannot stress enough how important the treatment of this condition should be confined to a dermatologist’s office as I have seen numerous problems with infections and permanent scarring when this situation is approached by well-meaning others. What should you avoid if you are allergic to poison oak? Poison oak is now prevalent in southern California. For those of you who have ever had a poison oak allergy, it is now time to be particularly careful. Hiking areas and even park grounds can hide this devious culprit. You must be vigilant in trying to avoid contact, especially during this time of year. Some of the things that you might want to consider would be avoiding rubbing up against any kind of brush/trees/bushes while walking or running outdoors and avoiding all fires made with wood or branches where poison oak may be growing as the smoke is a strong allergen for every part of the body with which it comes in contact. I recently saw a patient who had been carrying pieces of wood across his arm while clearing brush. The wood had been in contact with poison oak, and the bark had rubbed the resin into his skin. The rash seen from poison oak is red, itchy, and frequent blistering. In many areas, a linear scratch can be observed. Poison oak on black skin reacts similarly to the allergies on whiter skin; however, the lesions may be harder to diagnose and differentiate from other skin conditions. In addition to the allergic reaction, poison oak frequently becomes secondarily infected, which can add honey-colored crusting to areas that have been scratched. The rash tends to be intensely itchy. Initial treatment at home can be over-the-counter 1% hydrocortisone cream applied frequently throughout the day, as well as calamine lotion to the blistering areas. Over-the-counter Polysporin ointment (not any neomycin containing ointments) can be applied to any bacterial infected areas producing these honey-colored crusts. A poison oak allergic reaction can be very serious and extremely uncomfortable. If at-home treatment doesn’t significantly help, a visit to your local dermatologist is highly recommended. What’s new with tanning salons? Some places are now making it illegal for people under the age of 16 to use tanning salons. This is because tanning salons significantly damage the skin and predispose people to skin cancer. Under no circumstances should individuals visit tanning salons. This is especially true for children and young adults. Are insect and spider bite reactions a summertime hazard in Los Angeles? Yes, there are many more cases of severe reactions with insects and spider bites during the summer. Insect bite reactions are especially common in Los Angeles because of our varied topography: hills, mountains, reservoirs, and beach cities. LA insects can be found almost anyplace within the city. Dermatologists in Los Angeles recommend the use of an insect repellent whenever possible when enjoying the LA outdoors. Mosquito bites can usually be treated with over-the-counter 1% hydrocortisone cream and over-the-counter antihistamines; however, if the bites become severely red and itchy, then a visit to a dermatologist would be appropriate. Spider bites present more of a problem. If you get a bite that becomes very red, hot, and swollen, it is best to seek medical attention from a competent dermatologist. Such bites may require oral or injectable medications to prevent severe infection and allergic reactions. If a severe bite goes untreated, the infection can become systemic and spread throughout the entire body. Bees and wasps can also present a problem in the summertime. For a quick treatment if the stings are not too severe, a small amount of household ammonia can be applied to the area in an attempt to neutralize the reaction. If you have an aloe vera plant at home, you can snip off the end of one of the leaves and put a small amount of the aloe vera juice on the area and rub it in. In addition, the over-the-counter treatments mentioned above are also effective for these reactions. Stings from bees and wasps can also produce very severe allergic reactions that can result in death if not properly treated. If you experience any generalized rash (hives), especially associated with trouble breathing, then you should seek out your nearest emergency room for immediate treatment.